Podcasting is becoming an increasingly popular trend on the internet these days. In case if you didn’t know, the podcast is an audio file that is available on the web for downloading. They can be played on computers and other devices such as smartphones. Why podcasts stand out from mp3 files? Is that when you subscribe to a podcast, it brings to you the audio you want. So you don’t have to search for a particular file. You will be informed if a new Podcast is available. So the immediate question that comes is how do you host your Podcast? Having your website for getting the Podcasts organized is the first way. But this is not always possible. Here are Top 10 Websites to Host your Podcasts which will be the solution to your podcasting worries. SoundCloud, as we all know, is a popular website for sharing music. The site is targeted for musicians but is still a good option to host your podcasts. SoundCloud has free and paid services. With the paid service, you will know who has listened to your podcasts and other significant detailed. Your SoundCloud account will have a unique address, and people can listen to it and share it on other social media channels. The website has a sleek interface and the fact that it has many users from around the world will mean your podcasts will not go unnoticed. Internet Archive is a website that can host audios, videos, images, books and much more. You can also upload your podcasts as it supports mp3 files. Replacing the media once it has been uploaded is not possible on this website. 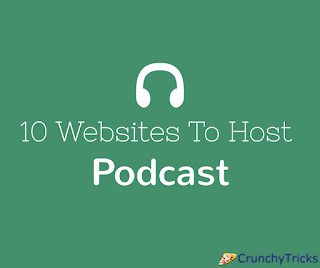 Although it has a few limitations of its own, it still serves as a good option for hosting your podcasts. It is very popular and finds many users on a regular basis. Above all, it is a free hosting website. Amazon S3 (Amazon Simple Storage Service) is a paid platform for podcast hosting. It offers a lot of features which are quite remarkable considering the price you pay for it. Amazon S3 has a free plan which limits the size of your storage to 5GB and a limit of 20,000 get requests. You can upload any media using their service. The price will vary according to the number of subscribers and the content you upload. It is very easy to use, and the app is available as well. Podomatic is another website that has free and paid plans to host your podcasts. With the free plan, you can get 15GB bandwidth every month with a modest storage of 500 MB. This may be well enough for monthly podcasts on a casual basis. There is an option to create podcasts directly on the website as well. It might be a slower option as it may take some time for the media to get uploaded. The Android and iOS apps are available too. It is easier to share the podcasts with friends over Facebook and other media through Podomatic. Libsyn is one of the oldest and still running podcast hosting service. It is not free to use but has gained its popularity. The two plans available are Classic, and Advanced Depending on what you pick and how much you pay, the storage size and other options are decided. The lowest of the plans start at $5 per month, offering 50mb monthly storage. There are features such as Podcast RSS Feed and HTML5 Media Players as well. Podbean has a friendly interface which works well on the mobile app too. You will have a lot of storage to cope up with the increase in the size of the podcasts as your popularity increases. There are many customizable themes and widgets to make the podcast page look more attractive. You don’t need much programming knowledge required to deal with it. It also has a lot of analysis tools to help you know how well your podcast is performing. Buzzsprout has free and paid podcast hosting options. Also, you can easily find listeners with embedded audio players from Buzzsprout, free starter website, and directions to do to iTunes and other podcast directories. You can smoothly connect social media accounts like Facebook and Twitter as well. You will get the statistics regarding who listens to your podcasts and other information regarding how well your podcast is. A 90-day trial is available if you want to try it out before you buy it. Blubrry is ideal for podcast hosting with features like WordPress integration and unlimited storage and bandwidth options. You can see the podcast statistics, download them with print and export options. There are podcast subscription tools and podcast SEO settings. With many such features, Blubrry is an all-in-all podcast hosting solution. Three different suites are available- Basic, Deluxe and Pro. Basic is the free version with limited features. Deluxe and Pro versions have more options to selects themes, plugins and much more. Podcast Blastoff offers podcast hosting along with a website builder with many themes and templates. With the podcast manager, uploading podcast to iTunes, Stitcher is easy. And there are options to view your podcast statistics and a lot of other tools. Your website will look very much professional even if you are not a great coder with so many widgets and templates. You can add links, images and YouTube videos with BlastPod Post Editor. There are options to schedule future podcast episodes too. Squarespace is well fit for beginners. The tips are easy to understand, and they provide tutorials for it. It has detailed step by step instructions on what you have to do to enable iTunes RSS tags and other features. There are many templates sorted into categories. You can choose the best depending on the type of content you are delivering. You can have the free trial. The models are magnificent that it gives a lot of professional looks to the website. These sites are for podcasting any media file but it preferable that you use it for audio files. The video files will have huge sizes, so the best option is to use YouTube. From among the sites listed here, you can go with Libsyn or Blubrry. While there is an option to host the podcast directly to your website, a separate podcast host offers many other advantages. The analytics and results are a couple of such positions that will take your podcast to a new reach and help you get income as well as make your podcast more attractive.